An awesome item drops in the world! What shall you do with it? Should you vendor it? Looks valuable, someone may want it! You could shout out in /trade; you could also use the auction house. … but how much to charge? Ok, so what does mean for my item? The auction house in WoW is an interesting place; a lot of gold can be made – and lost – within its walls. The auction house has been available since WoW’s release and hasn’t really changed that much since then – only the venues have changed. Apparently the code underlying it hasn’t changed much either – at BlizzCon the devs mentioned it was one of the things holding back how many players can be on a single realm. At the start, auction houses were in each capital city and separate from the others; something put up in Stormwind wouldn’t be seen in Ironforge. For the Alliance, Ironforge became the main AH thanks to its closeness to the main raids of Vanilla. There were the neutral auction houses run by goblins as well, based in Tanaris and Booty Bay. These were the only way you could transact with the opposing faction. For a larger fee, naturally. Time is money, friend! Over time, this changed. With the faction capital auction houses merging in patch 1.9, just before The Burning Crusade was released. The faction and neutral auction houses merged into a single realm-wide AH when Warlords of Draenor was released. The key to making money on the AH is to sell what other people want; the saying “Buy low, sell high” is true here! However, just as in the real world, there is lots of complexity behind such a simple statement. People forget when they interact with the AH that there are also two sides to a transaction – buyer and seller. Buyers want to get the cheapest price for the items they require. Sellers, naturally, want to get the highest price for their items. Unfortunately there isn’t pricing transparency on the auction house – you can only see the sell side of the deals. You don’t see the prices people are actually buying things for across the entire auction house – you can only see what people are buying from you. This can lead to curious things – eg the farmer’s brooms from Draenor which you can buy from a vendor for 30s, but which have a price on the AH in the 1000s of gold thanks to people blindly following sites like the Undermine Journal or their own AH scanning data. I’m still selling these for 99g from time to time when people see their price as being in the 1000s – either in data or from other sellers – and assume I’ve mis-typed the price I’m selling for! If you want to learn more of this type of trick, have a read of Priceless which goes into the psychology of prices. The “But its on Undermine for 1000s!” above is a bit like the price anchoring this book talks about, where a price you see tends to move other prices around it – acting like an anchor. The lack of pricing transparency means its a lot harder to tell what markets are doing. You can guess a certain amount from the volume of an item for sale – although, since we can’t see the sell side, we can’t put too much faith into this. There is, after all, a madness in crowds! Markets are rarely rational thanks to them often involving humans – see Priceless if you want examples of this. However you can intuit a certain amount – eg flasks are likely to sell better at the start of a raiding week. And flasks sell better in stacks of two to three as most raids will last two to three hours. So putting up flasks in stacks of two on the night before a reset is a reasonable thing to do. Unfortunately, a lot of people will also do this. But demand is high – so the prices don’t really go up that much, but flasks do sell more. Really what this comes down to is the rule of supply and demand – if an item is sought after and has a low supply you’d expect the price to be high. Conversely, if an item is sought after, but has a high supply you’d expect the price to be low. And if the item isn’t really sought after it may not be sellable, even if it has a low price. 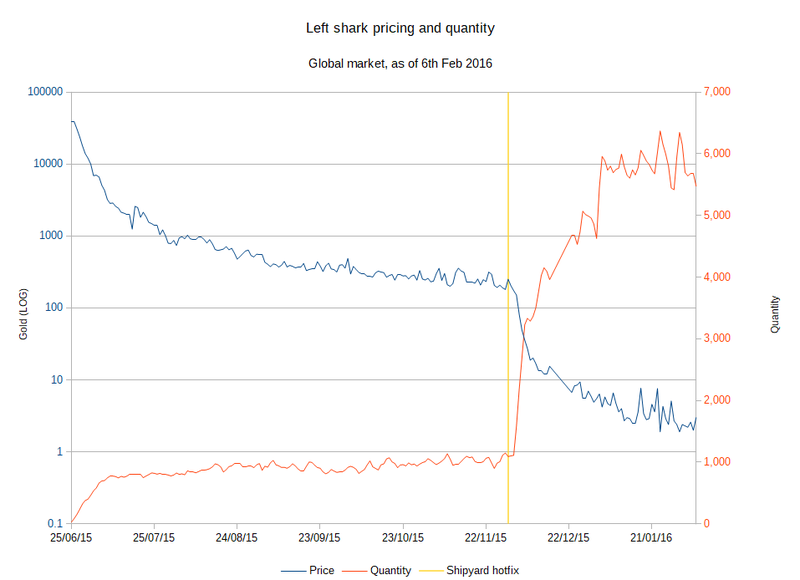 A good example of how prices can change with supply is the lowly Left shark. Added in Warlords, this was a battle pet which came from a rare naval mission – so rare that you’d see almost no Left Sharks on the AH. Blizzard then hotfixed it to have a higher spawn rate. A much higher spawn rate. The first left sharks were being put up for 50k gold or so – some of that may have been people taking a punt on pricing; after all, if the deposit is low, the item seems rare and you don’t have pricing data thanks to it being a new item why not aim high? As people had the mission spawn you saw more on the market – around 1000 or so – with the price dropping to more reasonable levels, 100-200g. 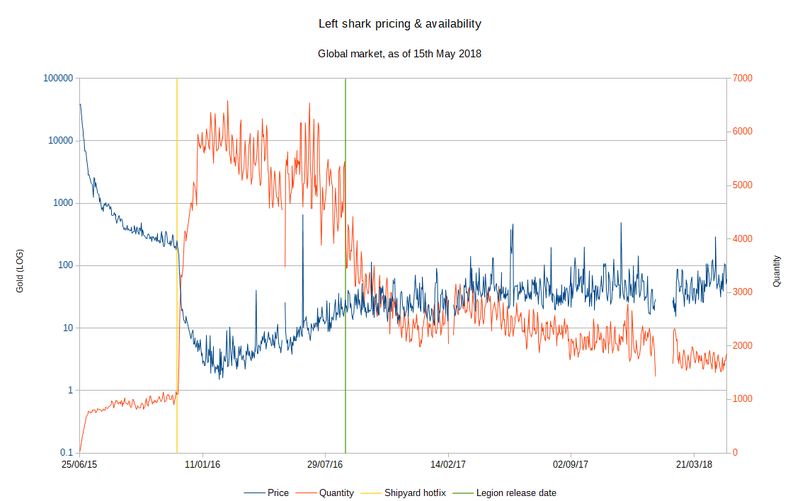 Then the hotfix came in and the number of left sharks available sky rocketed, with the price plummeting as a result. 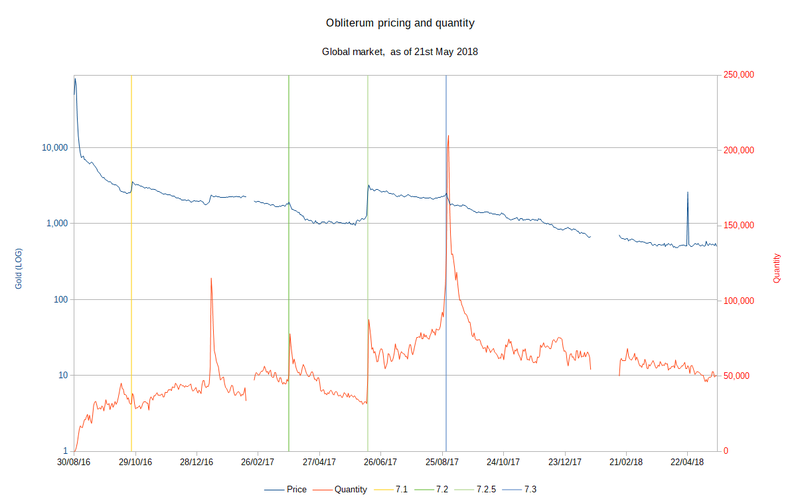 I had to make the pricing graph use a log scale to accurately show the pricing thanks to the range in prices of 50,000g down to 1g. This shows what happened whilst people were running the naval missions during Warlords; but what happens when that stops? After all, unlike the garrison, naval missions used oil as their cost and is harder to get than garrison resources. With the release of Legion the number of Left Shark on the AH rapidly dropped, but not to zero. Instead, it slowly dropped off and the price slowly rose until its in the 80-100g range. Why did this happen? Well, a lot of people saw the very low price and either stockpiled their left sharks or brought them up from the AH – knowing that in time the price would go up again. This is very much the long game which requires space to store things – you’ll often find people who play the AH have storage chars or even storage guilds to store things over the long term to improve their profitability. There are also seasonable effects – the Minion of Grumpus is a good example. The spike in availability of the mount was due to a bug – people could check the loot box’s content and sell it back to the vendor if there wasn’t a mount inside. I’ve marked the periods the mount was accessible to farm with the blue colour; you can see how immediately during the holiday the quantity on the AH goes up & the price goes down. Then, once the holiday is over, the quantity drops & the price slowly recovers. This was even more extreme during the Xmas of 2017, likely thanks to the amount of gold Legion had pushed into the economy. This cyclic behavior can be taken advantage of, with buying up the mounts during the Xmas period when they’re cheaper and then holding onto them until the price goes up mid-year. You can also get per-patch changes in items – for example Obliterum was used to upgrade crafted gear in Legion – and this is where following the changes on upcoming patches is useful. 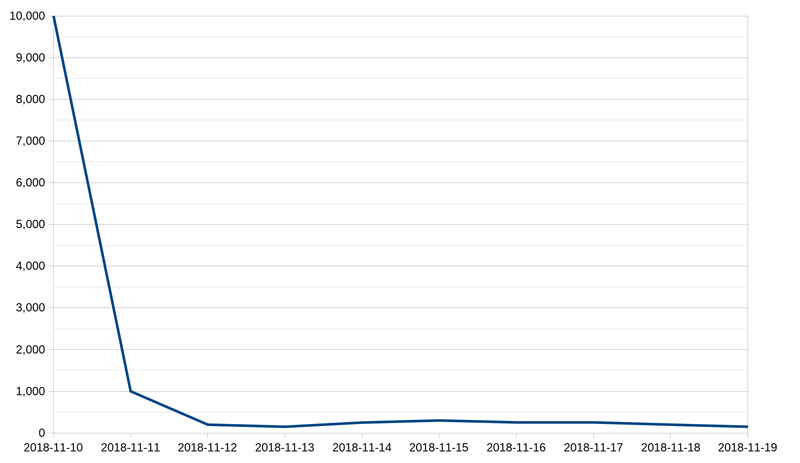 With this graph you can see the initial price spike at the start of the expansion as people are chasing gear to be raid-ready; this type of spike often appears for world epics, crafted items and any other item which helps raiders get the gear they need to start raiding. The value of such items drops off quickly as raiders gear up with gear from raids. The price slowly dropped over the expansion, with brief spikes up when new patches were released as people tried to get more gear. When 7.2.5 was released, Obliterum could be used to upgrade crafted gear an extra 10 ilvls – to 885 – instead of 875. Whilst there was a jump in number available, this didn’t stop the price from going up – too many players were needing the obliterum to upgrade their existing gear. 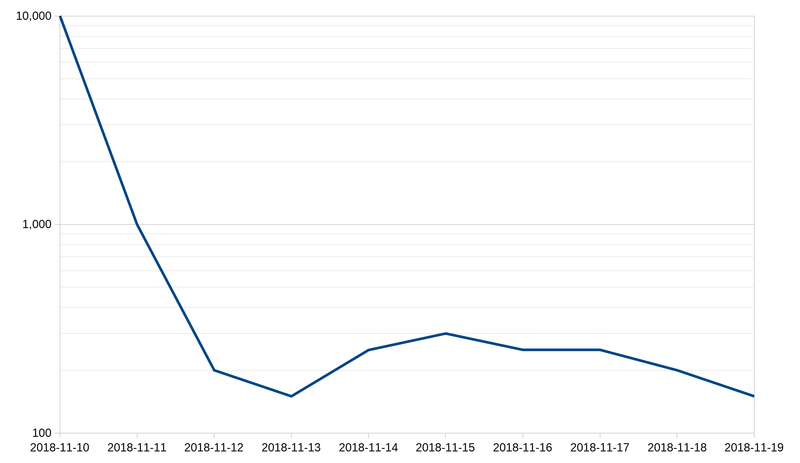 However when 7.3 was released, there was a massive spike in the amount of Obliterum available – players were trying to make more gold from expected obliterum sales. 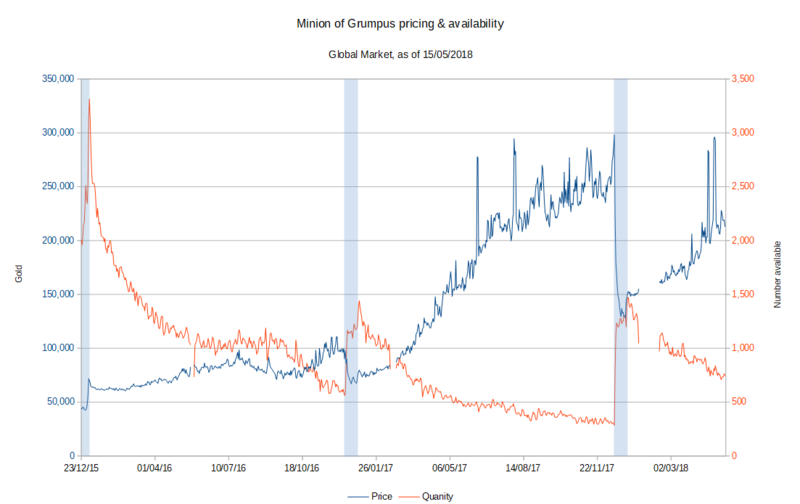 It didn’t happen though – the price stayed roughly stable and is a good example of how, even if there is an increased demand, if there is more supply than demand prices will be stable. Patches and expansions can change things in other ways – in Warlords and Legion the missions injected a large amount of gold into the economy, causing somewhat predictable inflation. In BfA, the missions bring in a 10th of what they did in Warlords and Legion. The long term effect of this reduction in gold has yet to be seen. Even if there are other items the same as yours up for sale on the auction house, I’d still check the Undermine Journal for pricing here as its a good guide for what to expect. They have an addon which can insert this data into tooltips to make this easier; see https://www.curseforge.com/wow/addons/undermine-journal. It could be the AH prices on your realm are inflated. Or it could be that players don’t know the value of the item. However realm has a different economy – what sells well on one realm may not move at all, or have a massively depressed market, on another. In the left shark graph above I made use of the log scale to better show the data. But what is the log, or logarithmic scale? Rather than a linear scale (1, 2, 3, 4, etc) it uses orders of magnitude (0, 10, 100, 1000, etc) for each point on the scale of the graph. This allows for better display of data which has a large range of values – as the left shark pricing does. We could display this with a linear scale; but doing so results in the following, which hides a lot of what occurs after the value drops. This entry was posted in Gold making, Numbers. Bookmark the permalink. 5 Responses to How much is that Left Shark in the window? I think I originally came up with the initial idea during the end of Warlords after the hotfix for the left shark came in!